What do we know about the crusades? Almost nothing, I bet. So President Obama might have done everybody a favor with his ill-considered reference to events going back almost a thousand years. He caused some of us to try to refresh what we we read about in school — and in comic books about Richard the Lion-Hearted — many years ago. People have committed terrible deeds throughout history, but that doesn’t mean we should not condemn and try to prevent terrible deeds done now. What we should not do is judge long-ago historical events from the perspective of civilization in the 21st century. We can recount the events, and in the case of the Crusades there are many different versions and opinions, but we can’t possibly understand what was in the minds of our ancestors in 1096, when the first crusade began. The story is that through the Middle Ages, Christians were free to make pilgrimages to the Holy Land, controlled by Arabs since the seventh century. But in 1071 Seljuk Turks, who had taken much of Asia Minor from Byzantium, captured Jerusalem and began inerfering with Christian pilgrims. 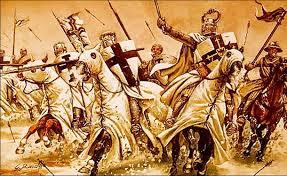 That’s what gave rise to a call, at the Council of Clermont in France in 1095, for liberating the sacred sites. Somehow burning one person to death is horrid, but incinerating anonymous innocents with drones is OK. Go figure. ISIS is posting videos of their beheadings & immolations for pure shock/fear effect. Certainly “innocents” are being killed by drone strikes, because ISIS hides behind “innocents”. How many more innocents would be killed if we allow ISIS to survive? You can’t “play fair” with someone that “cheats” and prevail. Sad, but true. You’re “damned” if you do and “damned” if you don’t. So Hasso, where in the heck can you point to where Obama, or pretty much anyone else in authority in the western world, seeks to “…excuse the deliberate cruelty of the Islamic State beheading helpless people or burning them to death in 2015…” ??? That is a straight up lie Jim. You should apologize. I’ve listened/watched newscasts on the Obama NPB speech all weekend. Obama was raised as a Muslim—don’t know what sect. Although he professes to be Christian now–he finds it almost impossible to admit a problem exists within radical Islam because of his early associations and teachings. An apt description of the Crusade campaigns of a millennium ago. Also, one could argue, a fair description of the incursion of the US and coalitions forces in the Middle East region of the past decade. Perhaps we could have learned something worthwhile to inform our decision of whether on not to invade the region by referencing that history. And even more so by taking into account the more recent difficulties of the Russians decade of hardship in the area.